Our third Members page is by Robert Meguid of the U.S.A. He shares what drew him to the hobby, especially to resin, what projects he is currently working on and plans to do next. Your contribution is appreciated by all of us at IRMA, Robert! I have been building kits for 30 years, since I was 3 years old when my dad bought me a 1/72 Monogram Snap-Tite B-26. As a kid, building kits occupied the long winter months. Now, I build as a release from my chosen profession, but can usually only find a couple of hours per week to devote to the hobby. I collect 1/72 scale aircraft and spacecraft to build, but this has resulted in a back-log of kits, which will keep me occupied for many years to come. My focus is currently on experimental aircraft. For the most part, I find prototypes and experimental aircraft more intriguing than service aircraft. As much of my recent building has taken place while on vacation, I have gravitated towards jet aircraft, which lack propellers to get knocked off in transit, and missiles and display models, without cockpits/ wheel wells that need to be painted before major component assembly. I no longer take paints with me on flights, as travel regulations make this difficult, and cyanoacrylate glue needed for resin kits is easy to buy on arrival to travel destinations – enabling the building of resin kits. A quick build, but like the Atlas family, difficult to find good references – most came from online searches. Detail is good, and molding was crisp. However, there were air bubbles, and I replaced one of the fins with plastic card. The joint between the cast resin parts and the fuselage tubes was challenging to clean up. A display-type model from Sharkit, this was my first SHARKIT build. Alignment of the fuselage was challenging as it comes in fore and aft halves. Alignment of the wings was tricky, and much filler was used. Decals were from the Pavla Hawker Hunter prototype conversion set. 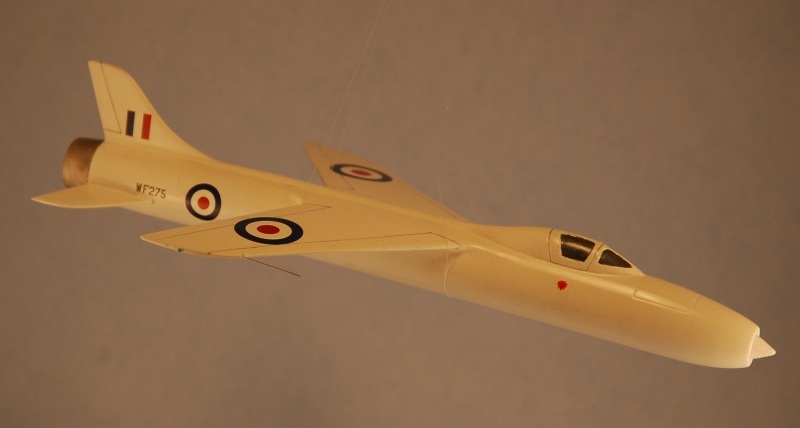 Ren provides great in-scale line drawings with his kits, and Buttler’s British Secret Projects: Jet Fighters since 1950 was used for additional reference. This is a very simple cast resin kit, from Herr Schorsch of Classic Planes, in Essen, Germany. It consists of just one part, and depicts Clem "Birdman" Sohn of Lansing, MI, from the mid-1930’s. I modeled the kit after photos found online – there are several good photos and interesting histories on line, but all are black and white. I cleaned up the casting, added a parachute pack modified from an ESCI ground forces backpack, and mounted the figure on a plastic card base. The detail is good, but there were numerous air bubbles, some in tricky places such as on the tip of the wings, which I was unable to easily fill. The overall cleanup, construction and paining took ~4 hours, making this a 2-evening build. This is another simple cast resin kit, from Unicraft, of the Ukraine. It consisted of one figure, a helicopter backpack, 2 rotor blades and 2 counter weights. Research was conducted on line, and augmented the 3-view image in the instructions. 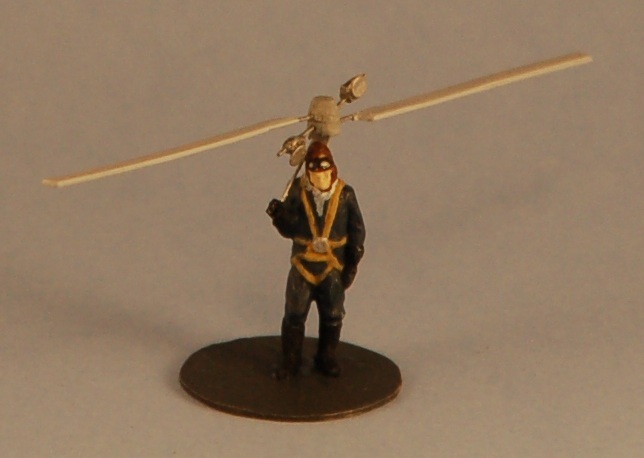 The figure’s detail was good, but the detail of the Heliofly was crude. I replaced the rotor blades with strips of styrene, and used lengths of guitar wire to replace the connections of the rotor blades and counter weighs to the rotor hub, as well as to fabricate the control handle. 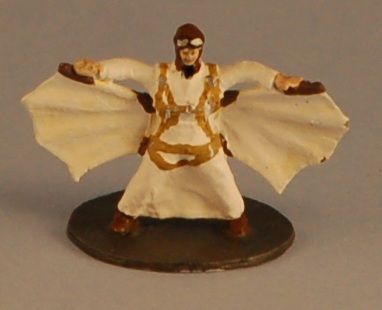 I painted the figure as Luftwaffe personel. My aim was to complete a kit within a week, no matter how simple. The whole kit took ~4 hours, including research. 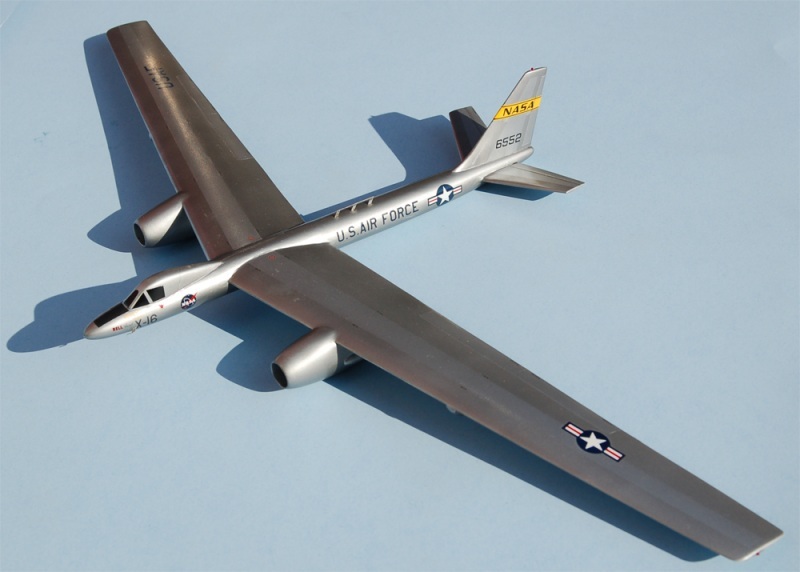 These 3 models were all built from the ANiGRAND CRAFTSWORK kit AA2065 "Convair X-11/ X-12/ Atlas-A / -B/ -D/ XB-65/ CGM-16D". The kit is basic in parts components and construction, and I chose it as I could build it while on vacation with minimal supplies. There were some air bubbles in some of the parts of all the kits and occasional warping of parts, and the quality of the molds varied slightly from kit to kit. The instructions were vague and inaccurate, so I utilized Jay Miller’s text "The X-Planes" for my main reference. In addition, I found a few photos on line. 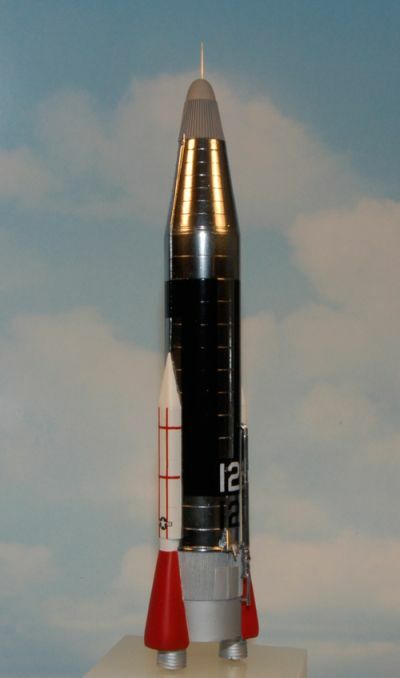 The X-11 was my first ANiGRAND CRAFTSWORK kit and my first use of Alclad II, using chrome over Model Master airbrushed gloss black. I was able to improve my results on the X-12 and the SM-65. For the latter two models, I scratch built some parts of the exhaust, and added a bit more detail. Decals for these kits came from the scrap file. ANiGRAND CRAFTSWORK decals tend to be thick and resistant to Micro-Set and Micro-Sol. This was another "vacation" kit, without a cockpit to paint. It was well-casted, with minimal clean up. References were found on line and in Jay Miller’s recent updated edition of X-Planes. The exhaust cone was devoid of internal detail, so I covered it with a red-painted disc of plastic card, as a cover. The rear insulation combing was poorly molded, so I replaced this with blue tack pressed into shape on wax paper, then covered with thin cyanoacrylate, and replaced some of the smaller parts, such as landing gear struts, with styrene tube and parts from the parts box. The paint scheme was easily achieved and effective. 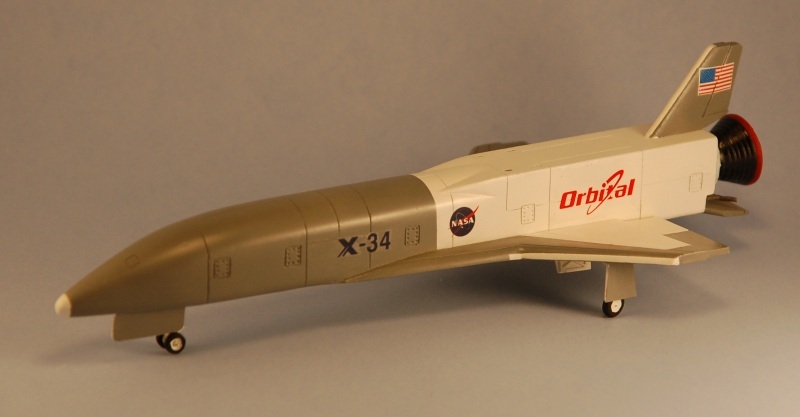 I cold not replace the Orbital Sciences or X-34 decals, so struggled with these – they have silvered. The kit US flags are not "handed" and were replaced, as were the NASA meatballs.